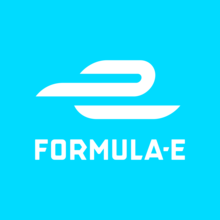 Formula E was founded in 2014 and has fast become one of the most exciting racing series’ on the planet. 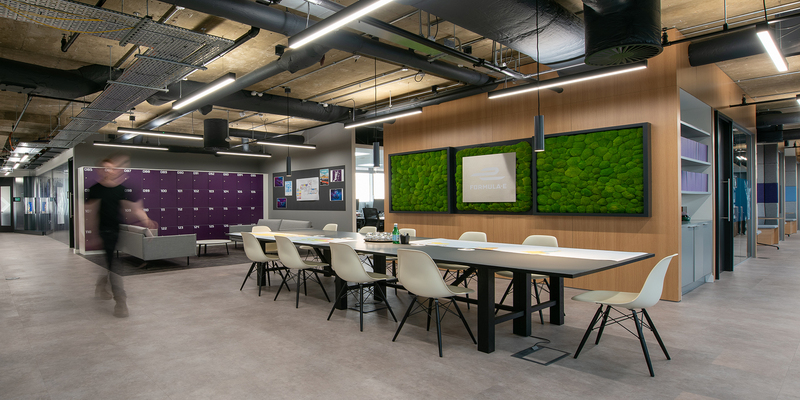 Having acquired further space in their existing building, our client required a complete refurbishment of their existing and new space whilst continuing to occupy it. 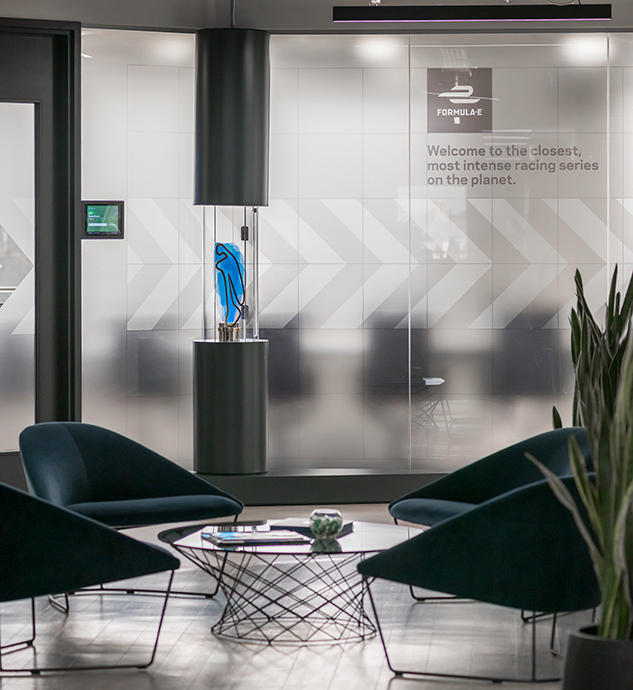 The design brief included a desire for a more social and connected space, an office that reflected their passion for racing and that upheld their commitment to sustainability. 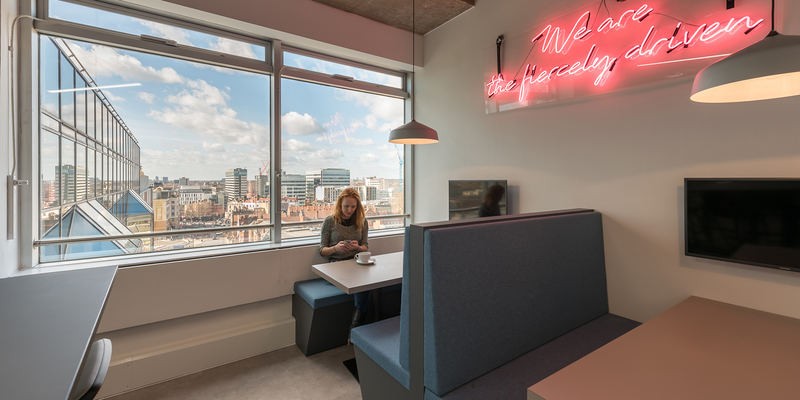 Three distinct wings of the office form one large working space, with a large breakout area adjacent to the central core, forming a heart of the office. 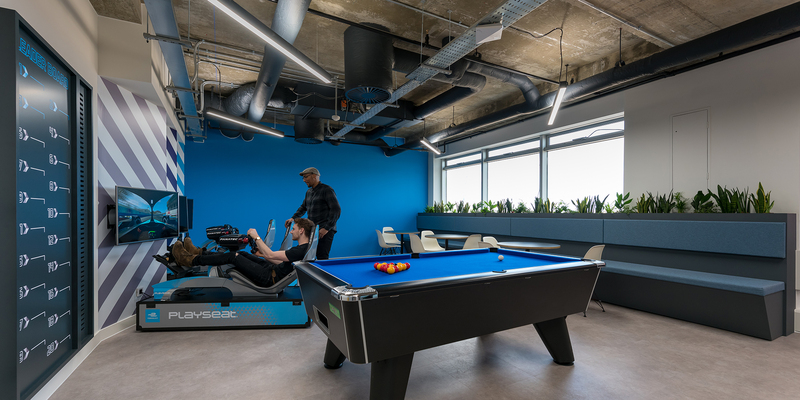 Multiple touchdown spots, phone booths, small meeting areas and relaxed working zones punctuate traditional desking allowing employees to choose appropriate workspaces according to the task. Deep greys and purples set the mood with Formula E blue bringing in vibrancy and brand familiarity. 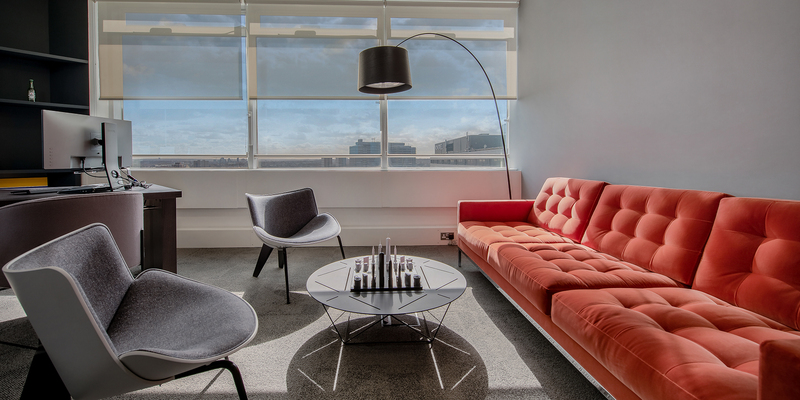 Throughout the office the majority of the scheme is monochrome to ensure that the brand elements really stand out. The focal point of the office is no doubt the car that is suspended from a compound curve wall and looks to be hurtling towards the entrance of the office. This car is the heart and soul of the racing series therefore it was appropriate for it also be the main feature of the team’s headquarters. 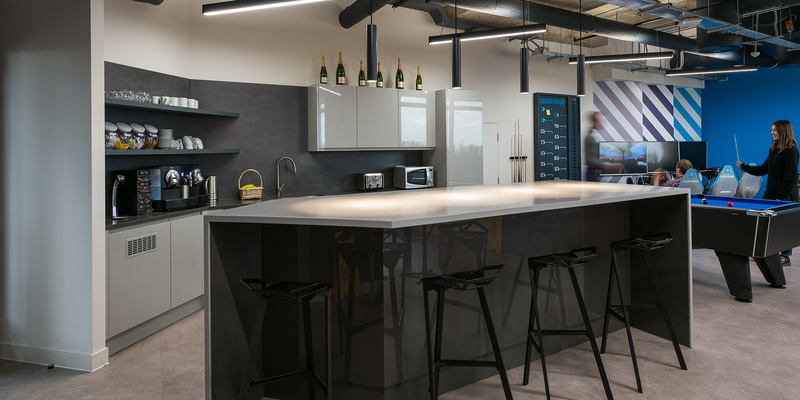 Lighting throughout the scheme is purposefully understated and task-led except for where it aids in illuminating the brand such as highlighting the trophy or the logo within the back-lit Perspex reception desk. 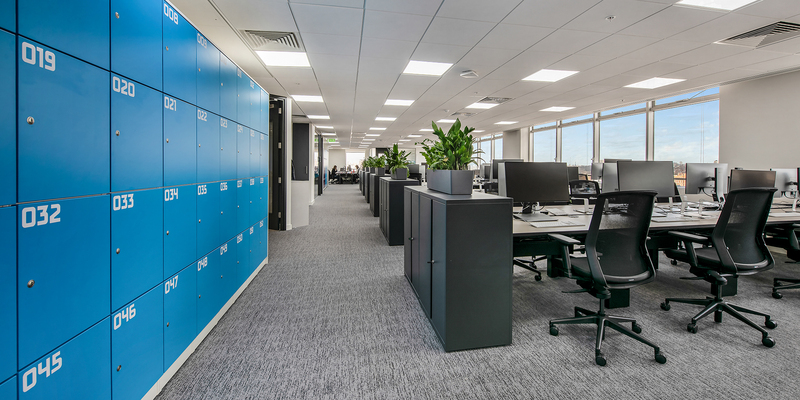 Sustainability was key to the design and considered at every stage resulting in the use of many sustainable office materials. 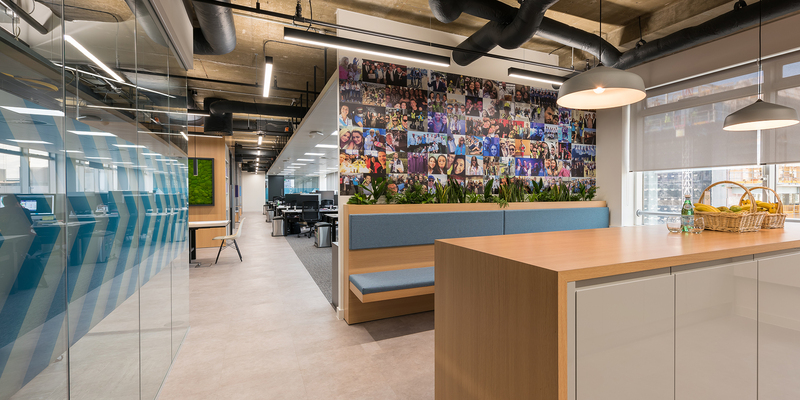 Some examples of this are the EGE Carpets which are part of the Ecotrust collection and are fabricated from recycled water bottles and used fishing net yarn. The material used for our booths comes from Camira Fabrics, who use natural base fibre fabrics are made from harvested nettles, hemp and recycled coffee sacks. 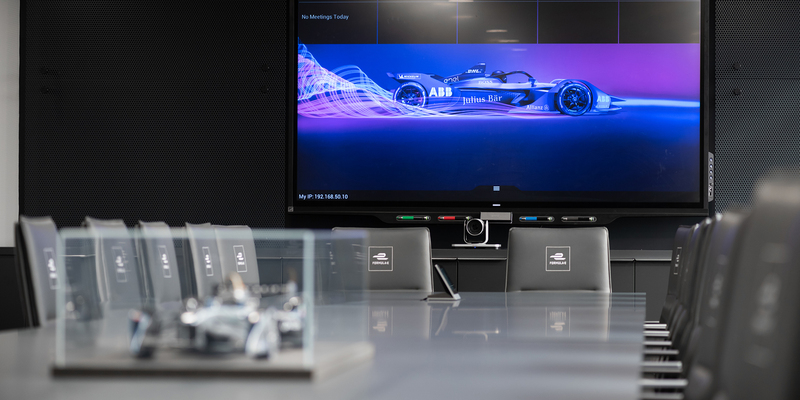 Key features: Suspended vehicle on curved wall in reception, sliding wall to extend boardroom into screen room, extendable boardroom table to seat up to 30 people, bespoke cylindrical trophy display cabinet, highly automated boardroom to showcase technology, racing car simulators in the breakout area.